On-premises: Servers are located and maintained in-house. Businesses are responsible for funding and managing both the hardware and software. Partner-hosted: The solution is hosted in a partner data center, either in a shared or dedicated environment. Now, with Microsoft Azure, Dynamics AX customers are considering moving to the cloud as it provides access to enterprise-class infrastructure at budget-friendly prices. When you deploy Microsoft Dynamics ERP on Azure, you will be using the IaaS offering. This means that the Azure ERP provides the virtual machines, storage, and networking capabilities. You must manage and secure the operating systems, applications, and data installed on the virtual machines. 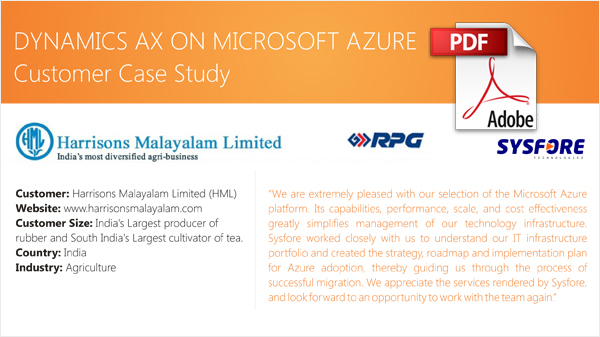 Sysfore has successfully deployed Microsoft Dynamics AX 2012 R2 on Microsoft Azure for an agriculture operation giant. This deployment resulted in an extremely scalable, accessible and cost-effective solution. The latest version Dynamics AX 2016 translates to a new cloud optimized platform for both public and private deployments, but with an on-premises option too. One of the key benefits of deploying Microsoft Dynamics ERP on Azure is that it avoids up-front capital expenditures by eliminating the need to invest in server hardware and server licenses. Instead, you rely on cloud infrastructure and global datacenters from Microsoft. By migrating Microsoft ERP Dynamics AX infrastructure functions to an enterprise-class platform like Microsoft Azure, you eliminate the need to invest in dedicated resources to manage servers on-premises. Microsoft Azure’s Infrastructure-as-a-Service (IaaS) makes it easier to deploy new servers, or migrate existing servers. You can quickly spin up a new server on Azure ERP within minutes from the server Image Gallery offered by Microsoft (including Windows Server, SQL Server, SharePoint Server etc. ), or the pre-configured/customized server images uploaded by you. Microsoft Dynamic ERP on Azure easily scales to meet increased workloads and a variety of deployment scenarios, offering much needed flexibility to meet the changing needs of your business. Deploying Microsoft Dynamics AX 2012 on Azure results in reduced downtime. Azure VMs by default have their virtual hard drives (VHDs) geo-replicated to a second Azure datacenter, providing a degree of protection against failure of some Azure hardware. Perform the complexities of managing a global organization with a centralized Microsoft dynamics ERP solution that helps standardize processes and gain visibility in your organization while keeping updated with changes in local regulations. MS Dynamics AX 2012 R3, the latest version of Microsoft ERP offering has been made available for hosting on a Windows Server Virtual Machine on Azure. Depending on the choice you make, the tool deploys the appropriate number of Virtual Machines by default as suitable to your purpose. We want to hear from you. Contact us today to learn more about Dynamics Ax on Microsoft Azure.